For many people in Myanmar, forced recruitment, landmines and religious discrimination are causes of displacement and obstacles to return. In BICC Policy Brief 8 \ 2018, Markus Rudolf analyzes the current conflicts and formulates recommendations for handling forced displacement in Myanmar from the perspective of sustainable development cooperation. To be able to find sustainable and long-term solutions for realities of protracted displacement in Myanmar and abroad, it is necessary to analyze challenges and options of development cooperation (DC) in Myanmar in detail. 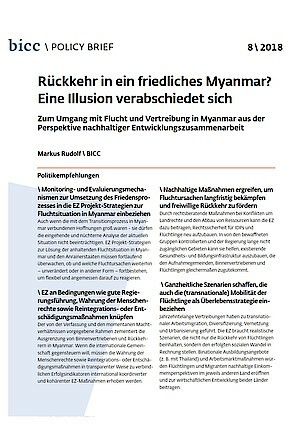 This is the outcome of BICC Policy Brief 8\2018 „Rückkehr in ein friedliches Myanmar? Eine Illusion verabschiedet sich“ (in German language). Moreover, to modify the framework conditions in such a way that survival strategies that were formed when people were forced to flee their homes can be used as potential of development, donors need to coordinate and develop regional, inter- and transnational projects with local initiatives in a participatory approach. \ Create holistic scenarios that also include the (transnational) mobility of refugees as a strategy of survival.